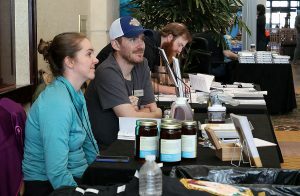 The 2019 AMMA MeadCon is being held from March 12-14, 2019 at the Omni Interlocken Hotel in Broomfield, Colorado. This is the perfect chance to network with colleagues, display your company’s brewing and winemaking accomplishments and share your new products or your most exciting, cutting edge research in the growing area of mead making and professional meaderies. Meet face-to-face with hundreds of meadery owners and mead makers. 1 complimentary registration for each sponsorship. Additional registrations are offered at $200.00 each. 1 complimentary registration for the evening MeadUp for each sponsorship. Additional registrations are offered at $50.00 each. To register, complete the hard copy registration form email it to vicky@mead-makers.org, or complete the online form below. Please complete items below and then click the Send Button to process your Exhibit Booth Contract Application. This contract reserves exhibit space at the 2019 MeadCon to be held in Broomfield, Colorado March 12-14, 2019. Confirmation of our space will be sent to us after all applications are in and vendor applications are closed December 31, 2018. It is understood that as an exhibitor, we are required to abide by the rules set by the event and all conditions under the space at congress venue. If any of our plans change, we may cancel this contract no later than 3 months prior to the start of the meeting and receive a full refund; later cancellation funds will be subject to a 75% cancellation charge of the total cost. Please note '*' denotes required fields. To complement your display, the AMMA offers a 25-word description in the Program Booklet. Please include your description here. Payment will be by check or credit card (see below for mailing instructions). If you prefer Paypal, we will send an invoice. Please don't send payment until we contact you with your booth number. The AMMA Swag Table is where you can sell your book or t-shirt to the Conference Attendees, if you don't want to have a table yourself. Our friendly staff will manage the selling of your things, and we will provide you with an accounting at the end of the conference, and an electronic transfer of your funds via the method of your choice, less the online credit card fees. The cost to you is pretty low, just $25 upfront, and 10% of sales at the end! There are limited spaces, we'll probably have spots for less than 10 items, so get in quick! Payment Information: If using credit card, please give us the Name and phone of the contact person for the card you'll be using, and we will contact you for payment. DO NOT PUT CARD INFO HERE FOR SECURITY. Deadline for listing in the Program Booklet is January 31, 2018. The balance of the exhibitor fees is due January 31, 2018. Deadline for application is February 28, 2018.